I was on a job for a local pipeline company where they were exposing a section of pipe for testing. They had used a “Smart Pig” (a hard rubber ball filled with sensors) and pushed it under high pressure down the line to map out anything that needed attention. They apparently had discovered a possible thinning in a joint and decided to have a closer look. I went around and shot the crews as they were doing their thing and couln’t help but notice during a break, this wonderful little creek just down the hill from where we were all working. I walked down and took a few shots as reference for later and stopped, silenced myself and took it all in. It was wonderful – the sound of the water as it moved past me, was very calming. A gentle breeze tickled the tops of the grass and the leaves in the trees shimmered with delight. I sighed and turned around to head back up to finish the day. You may think I sighed because I had to go back and shoot an open excavation not 300 feet away. But I have to say I was struck by the beauty of this little valley and more amazingly how this crew and company were taking care to make sure nothing happened to it. I thought what people must think about companies like this, forming opinions based on some crap they hear in the news. I have to say the number of times I’ve seen them at work and especially when I work with the evironmental branch, just how much they care about minimizing the impact they have on the environment. I’ve seen them tape off huge areas of land close to a right-of-way because of a Lichen that they were protecting or stop work completely when Cariboo were walking across that same right-of-way. When I first witnessed this, I was actually in awe, and it challenged my notions of what I had believed. After all, it’s in the news – pipeline companies are bad. They don’t care about anything least of all the environment. I was very wrong. This piplene has been around for some time and it will be here for decades to come. It made me happy to be shooting for a company that gives a damn and makes a huge effort to ensure that this and other little ecosystem remain intact for all the inhabitants that call it home. I just came to here document the process and paint the outcome. 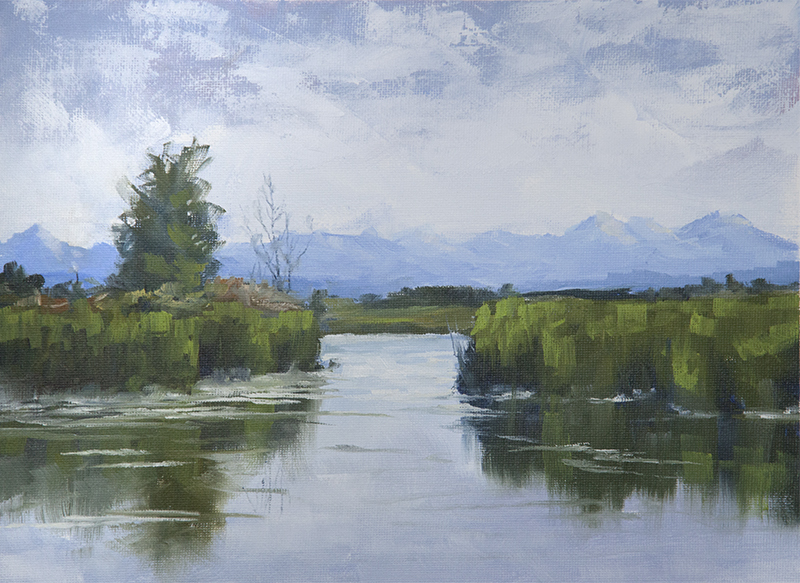 As part of Alberta Cultural Days, the Leighton Centre held two days of activities including an invitation to plein air painters to come and enjoy the beautiful scenery that makes the Leighton such a treasure. A.C and Barbara Leighton’s house sits on a hill west of highway 22 on Range Road 23. The vista looking west is breathtaking and I have witnessed several people who, after parking and walking around the north side of the house are left speechless, motioning to their significant other to come quick as if what they are seeing isn’t real and will vanish from sight before the other has a chance to see it. Normally, when I have arrived and have seen what others are painting, the view is paramount. How can you resist sitting on the hill and not be seduced into staying right where you are and painting the colourful foothills and mountains. After all they’re right there in front of you. But, I try to make things as difficult as I can. I walk around looking for something more intimate with colors and texture and light. Oddly, I realize that I shy away from the “Grand Vista” because it is so complex. Too big, too broad and open. I can’t have a conversation with it. 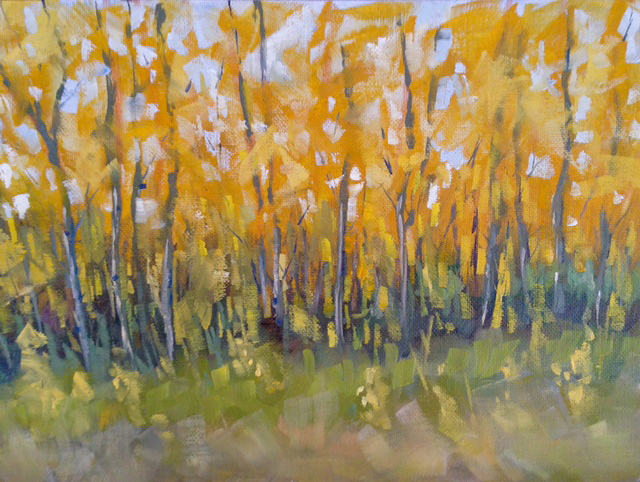 Yet I am drawn to the complex colors and textures of a stand of trees nestled in a bed of prairie grass. This painting was done in two hours and is probably the most abstract subject matter I have painted to date. Simple color and value, yet unbelievably complex. Squinting didn’t quite do it. I put my reading glasses on and used them to see my canvas up close, and happily blur the natural subject matter. Simplify and mass as the rule states. Stephanie Doll, the curator of the Leighton thinks this is one of the best piece she’s seen so far. I instantly bite my lip and become doubtful as usual – the rules of painting flooding into my brain. It seems complex and yet crude at the same time. I understand it’s abstract but I’m not sure I hit the mark. It’s a sketch but I instantly want to make changes. The main tree trunks are not defined enough. the sense of depth in the foliage isn’t where I think it should be. Do I stop or keep going? I find it interesting that I am becoming much more aware of what I feel the problems are in a painting, whereas before, I would stare at it and not be able to put into words what was needing attention on the canvas. What I begin to understand is, a work of art, any work, whether it’s painting, sculpture, or dynamic video, will find an equilibrium. A place where the artist and the subject meet. if your shy of the mark, you are too tentative. If you overshoot the mark, you didn’t stop when you should have. It’s a feeling. It comes with discipline, challenges and years of practice. A sensibility as many have called it. I guess as every artist through the ages has discovered, each shot at the target is a crap shoot. One shot is right on, while the next three are way off. Practice brings the cluster closer to the center and a silent understanding that every attempt after will never be perfect. There will always be something that can get in the way of of your success on a given day and something equally as powerful which will move you forward to a better understanding. Yesterday afternoon I headed down to the lovely Coutts Centre for an afternoon of painting. I was fighting the urge to stay home as we had thrown a big party for some family that are moving to Panama. Needless to say, the night was filled with tears, laughter, dance and song, as well as some libations which we all indulged in a little too much. So after a mental wrestling match, a couple of Tylenol and a BIG bottle of water I headed south for the afternoon. 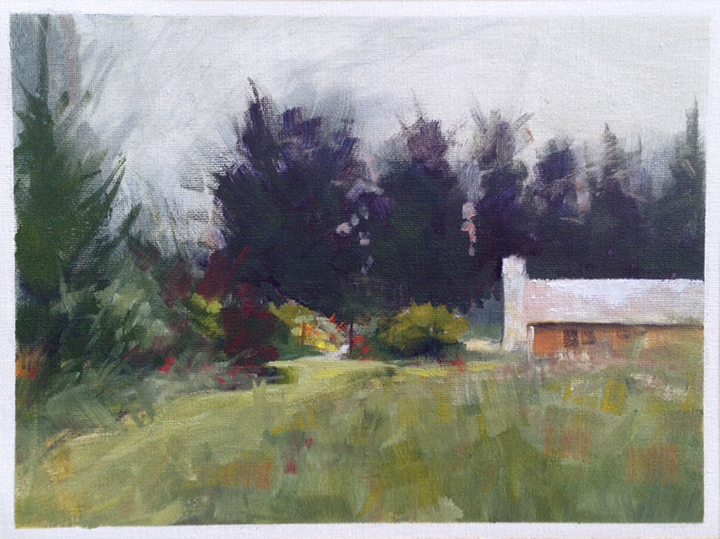 The rain which was forecast managed to hold off and I took a walk around the grounds looking for a place to paint. Several promising sites didn’t cut it because they weren’t in the shade and after about 30 minutes passed, I settled into a nice spot by the marsh looking towards the Poppy Garden and Chicken House (which has been converted into a summer residence). I quickly got set up and roughed in the general tones and values and wiped back where the building was to sit. I started with the centre right area and got my drawing in quickly, then I started to lay in changes to the value structure of the scene. It progressed nicely and I knew I had to start shutting it down as I could hear a little thunder moving my way and I had a ways to get back to the car. This is where I ended up. I’m going to continue to work on it a little to refine some of the areas but I know not too much with this one. I like how loose it is overall with the sharpest edges and brightest colors where I want you to look. Day 13/30… or, And Now For Something Completely Different! 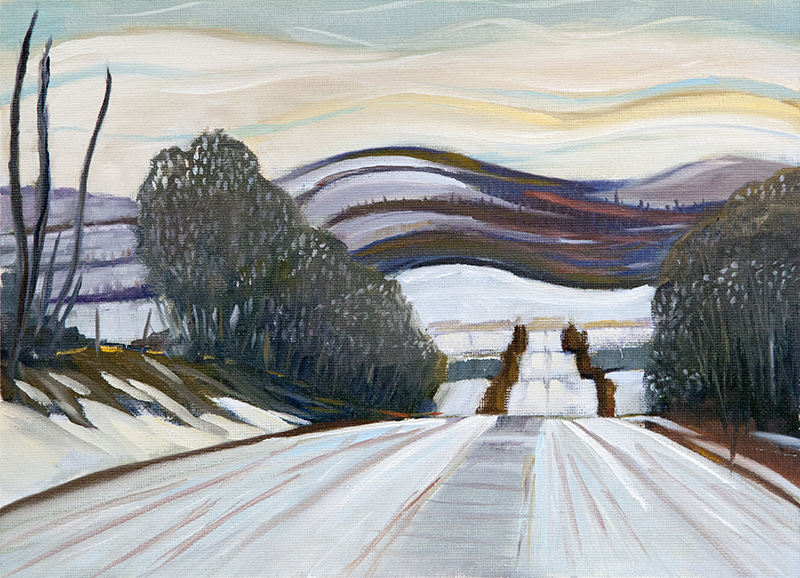 I started this painting of a gravel road southwest of town, and I was going to do it in my usual way. Try and stay loose and free and let it flow out. Well… I did let it flow and stayed loose but I also let my head go for a walk and just painted. Colours where I normally wouldn’t use them, shapes that were more emotional than representational. More feel and less think resulted in something that looks pretty tight which is not what I expected. I peeled the tape off after giving it a couple of hours and smiled – not necessarily because I thought it was great, but because it was different. So after being completely bogged down with life, I have come to realize that getting 30 successive paintings done in a row is not going to happen. So I am going to simply paint 30 on as near a daily basis as I can muster. 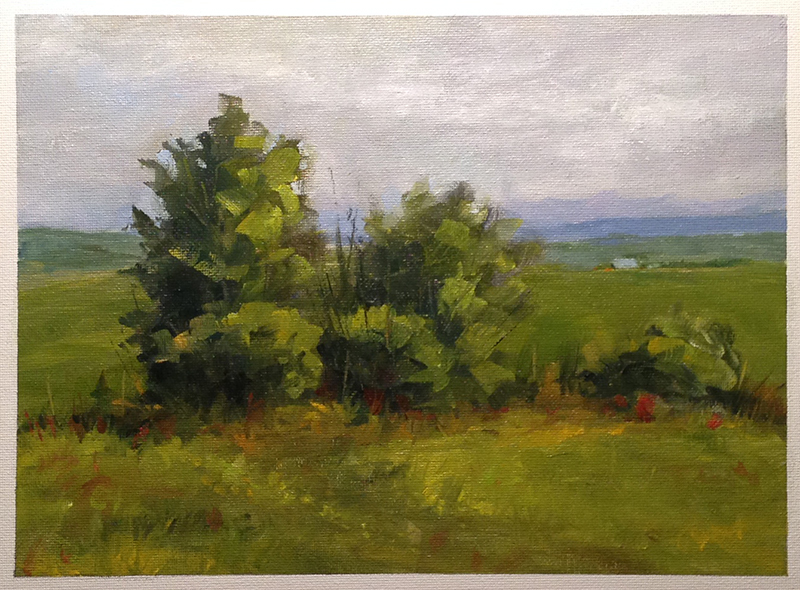 And in that spirit, I got busy last night and painted a scene which I saw west of the city on 53st. A lovely little wetland that straddled the road. I took the liberty of bringing the mountains closer as the camera as we know, likes to shove everything back as far as it can till you can barely see it. This was about an hour and a half total. One week in! Here is a scene I painted earlier this year and decided to give it another go. It’s along 69th St. West of the city where I have frequented many times in the car and on the motorcycle. Lots to paint out there.